A marriage of nonprofits: Young Kings and Queens, Inc.
Takisha Johnson in the colorfully decorated headquarters of Young Kings and Queens. Takisha Johnson gets ready for the Teen Hair Clinic where she teaches that every queen must care for her crown. Marcus Johnson at Western Michigan University on one of the college tours this summer. R'Shaun Palmer, in the red T-shirt with two youth participants of the ROYAL summer program serve food at the organizations second annual Back 2 School Jam. When Marcus Johnson and Takisha Booth-Johnson first met, they didn’t know that each had already planned their own nonprofits focused on empowering youth. As a single mother, Booth-Johnson was raising her son, R’Shaun Palmer, who often brought groups of friends to their home for dinner and to hang out. “My son started talking about his friends and how they had never been anywhere,” she says. “I am always about experiences. I know experiences expand horizons. Period. The more experience you have, the more options you see. “So I wanted to help provide the kids with experiences. Many of them, when they do think of going on a trip, they think Chicago or Detroit. There's way more to the world than that.” she says. Booth-Johnson, in addition to being a Mom to all, organized and raised funds to take the group on local expeditions, like a visit to Lowe’s where they would learn about tools and hardware, and on larger trips, such as to a waterpark in Wisconsin. Meanwhile, Johnson, who then lived in Battle Creek, had written his business plan for Helping the Youth Find Their Way, an organization whose goal was to help youth make choices and change behavior to avoid potential incarceration. The couple feel strongly that society imposes certain norms and expectations that don’t always support growth and development. “For example, an impoverished youth is told to have limited choices in who they can be in the future,” says Booth-Johnson. “I disagree and know they can live beyond that idea. Or a young woman who has a baby at 16 is told that she will never amount to anything and that her life stops with the baby. I disagree and have watched young ladies with the proper support become six-figure executives because they lived beyond the norm believing more was possible and not stopping until they achieve it. It’s a lofty mission, and one to which the couple subscribe to in all facets of the Young Kings and Queens programming, which includes everything from financial literacy, academic support, book writing, anger management, field trips, entrepreneurial skills, governance (through the all-youth YKQ board), nature experiences, fashion, and college preparation, among many others. This year, YKQ launched its 10-week pilot summer program serving 12 youths, mostly age 13 to 14. A couple of older charter members, including Booth-Johnson’s son, now 17, still participate. The organization also offers an open drop-in after-school program that goes until 5 p.m. Sponsored by the Kalamazoo Youth Development Network, YKQ also partnered in 2018 with the Kalamazoo Nature Center, Confident Soul, Junior Achievement, and Read and Write Kalamazoo (RAWK), among others. As a pilot program, Booth-Johnson said it was difficult to get funding, but they managed to raise over 60 percent of the $15,000 cost of the program through fundraising coordinated by the YKQ youth. That light shines brightly in the summer program and three days a week during Homework Help and extracurricular sessions after school in the Johnsons’ Rose Street garage, which is painted a friendly orange and simply decorated with a YKQ wall logo, tables, chairs, and posters. On “Ponytail Day,” the day On the Ground visits, large boxes of hair supplies take up the back corner so that the Royals can have their hair done. Booth-Johnson, wearing a purple shirt with large green letters that spell MOM, sorts through the boxes of supplies. She’s waiting for that first youth to walk through the door. It’s clear she’s eager to get started. In YKQ, the Royals are all those members who have not yet been crowned as Young Kings or Young Queens. The group’s first crowning will take place this spring during the YKQ Masquerade Ball, which is also a fundraiser for the organization. “To be crowned, you have to show that you’ve taken what you’ve learned from the summer and applied it during the school year,” says Booth-Johnson. This application is measured by consistency, qualities of character, and grade point average. Booth-Johnson says the organization’s name was chosen to help participating youth imagine what is possible and embrace their own best self. Through all the experiences Young Kings and Queens offers the participants, Booth-Johnson says she enjoys watching the youth grow and expand their capacities. “I love to watch them begin to take hold of their own lives and their own goals versus just following,” she says. “You can’t come asking Miss Teacher something that someone just asked for before you because if you didn’t ask for it in the first place, that means you don’t need it,” she says. One of the experiences YKQ offers its participating youth is boxing, which is coordinated by Johnson. 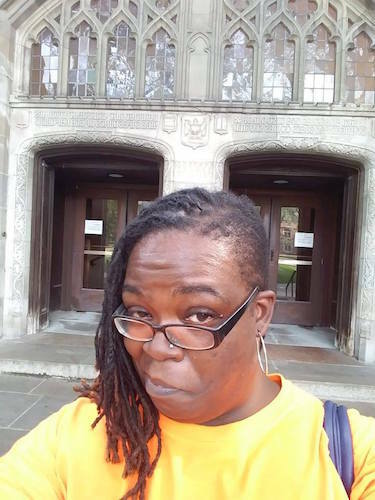 Takisha Booth-Johnson, executive director of Young Kings and Queens in front of law library at the University of Michigan on a college tour with young people this summer. A former boxer and kickboxer herself, Booth-Johnson and her husband realize that skill development, exposure to experiences, and talking it out aren’t always enough. Through boxing, Johnson shows the boys how to handle and express their anger without choosing behaviors that might get them into trouble or cause harm. And Booth-Johnson adds, the girls like it, too. “Can you talk about why you’re mad? If not, you need a way to get it out,” says Booth-Johnson. “Kids internalize what’s happening to their parents. And they might think that it’s their fault. But they’re not going to say that. Next summer, Booth-Johnson says she’s hoping to partner with a Kalamazoo boxing organization. Booth-Johnson’s son, R’Shaun will graduate this year from Kalamazoo Central High School, but he plans to stay on as the current YKQ Board Vice President. She says she’s not concerned about an empty nest yet. “I’m full with a lot of love that I got to give some more babies,” she says. “That keeps me invested in the future of our community. These are kids I won’t have to worry about in 10 years. They will be our doctors, our lawyers, our handymen because hopefully we can get some people in the skilled trades. Booth-Johnson, as Executive Director says her husband, as President, and the YKQ board will do some tweaking of next year’s summer program, which will likely run from noon to 5 p.m. during the week. Applications will be accepted starting in April. The group will continue to do college visits (they visited six this year), and they hope add other field trips. She gives a specific example. “One of our girls, she’s such a little artist. She also writes. But in her own space where she can write whatever she wants versus writing what the teacher wants her to write,” says Booth-Johnson. “She was one of my prizes this year. She’s developing from ‘I don’t trust you. I’m not going to talk to you’ to ‘I wrote a book and I can express how I feel comfortably,’” Booth-Johnson says referring to a book writing the youth completed with RAWK. For more Northside coverage, please follow these links.